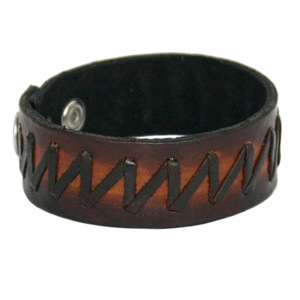 The Thai leather jewelry artisans present this wristband bracelet. The artisans decorate the center with a simple stitching pattern. 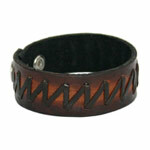 This two-colored leather bracelet is adjustable for 2 wrist sizes and closes with snap fasteners. Closed (Maximum wrist length): 19.5 cm length x 2.5 cm width.